World Book Day is a “worldwide celebration of books and reading”, happening in over 100 countries all across the globe, started in 1995 by UNESCO. 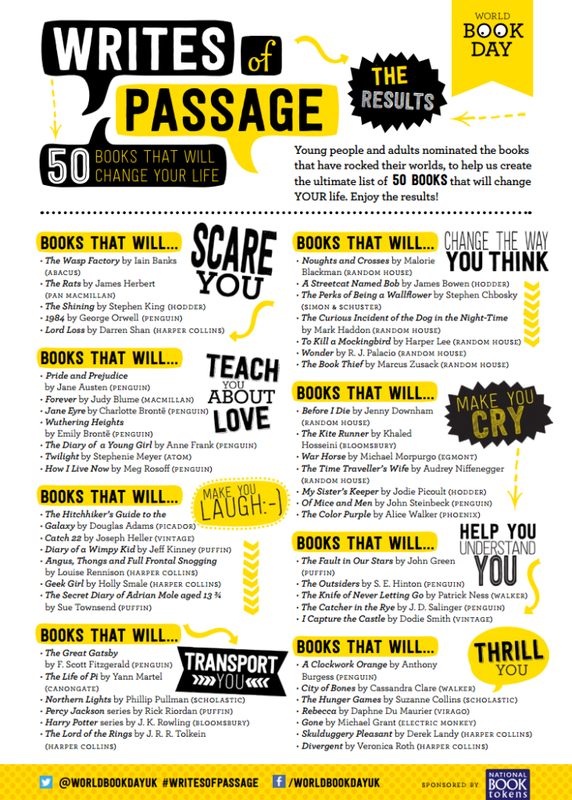 World Book Day Fest in the UK and Ireland asked old and young to find the ultimate list of 50 books for Young Adults, termed “Writes of Passage”, for the 2014 celebration. The list was published in February 2014 and included, among the Top Ten, J.R.R. Tolkien’s The Lord of the Rings, J.K. Rowling’s Harry Potter series, Charlotte Brontë’s Jane Eyre and George Orwell’s 1984.